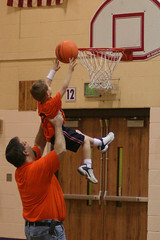 Here is BJ making his first basket during the last game of the season. The ref called a "technical foul" on the other team, which let BJ make his first basket. He was so excited. Check out the flickr site for more exciting photos!